At last I have the pictures from the Kool-Aid dying. I didn’t take any pictures during the dying process as I was too afraid I would end up dying the camara. Arrange yarn into required size skeins, remembering to tie in aleast four places or the result will be a beautifully coloured tangleed mess! Soak yarn in warm water and vinegar (this helps the dye to bind to the yarn) for 20mins, allow to dry or use when damp. Prepare Kool-Aid ( I used one packet with 200ml of water in a pint size plastic beaker). Dip required section of yarn into dye, squeeze excess back into beaker or into dish but returning to beaker before next dip. Repeat 2 or 3 times. 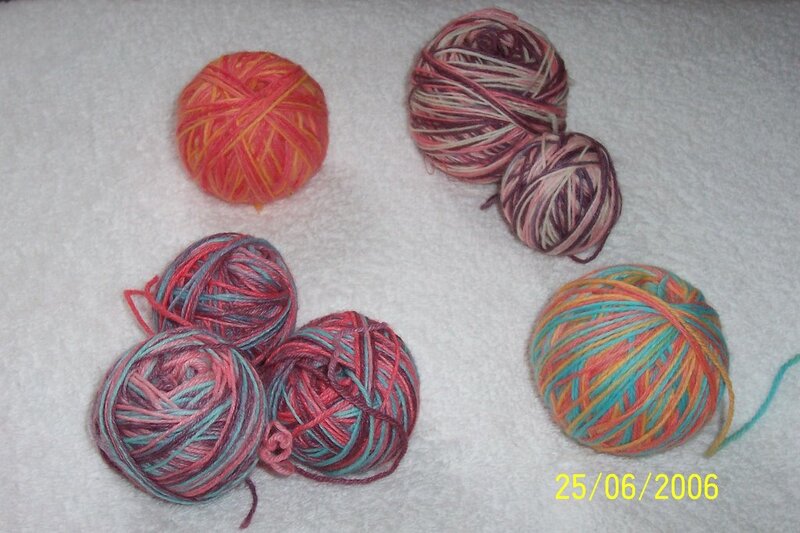 Repeat with different sections of yarn and differetn colours. 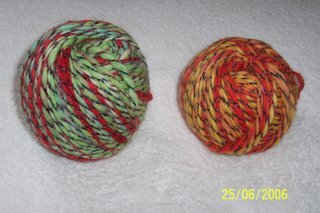 Place yarn in microwavable dish and ‘cook’ for 1 to 3 mins depending on microwave and yarn size. 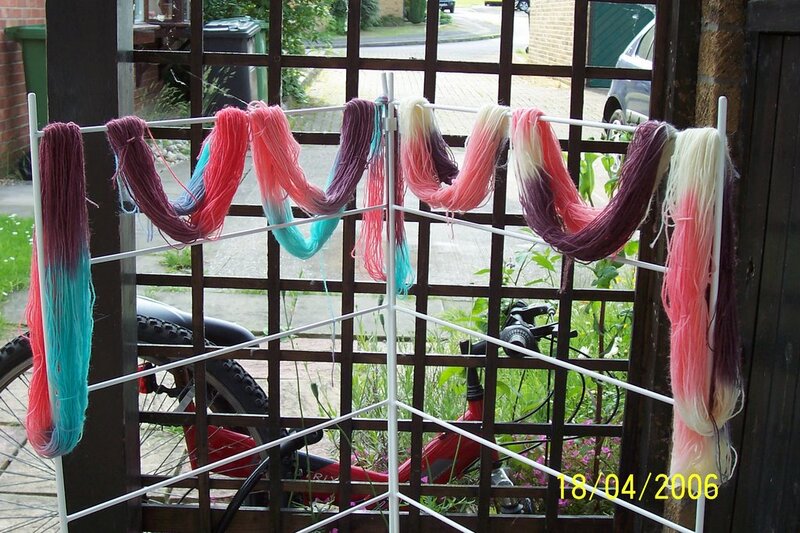 Here is the dyed Kool-Aid yarn drying outside in the sun. Really sorry but can’t remember what i used for these. I’ve been feeling really uninspired over the past few days. I just haven’t had that urge to pick up the needles and I really don’t know why. I have two projects on the go, a gorgeous wrap in Patons Coast and Washed Haze Aran and a pair of socks for my stepdad, but somehow they just aren’t giving me the fix I crave. I think it maybe that I have reached the stage where I need to venture to the more complex patterns. The trouble is I don’t actually have the confidence to start something ‘tricky’, as I still class myself as an advanced beginner – I’ve only been knitting since Dec 2005. I’m just hoping the ‘thrill’ of the needles returns soon, maybe its the weather leaving me feeling lethargic. I do have a great pattern from US for a lace effect shawl using recycled sari silk, but I’m waiting for the needles to arrive to start it. They should be here shortly, so maybe this will get the juices lowing again. Had an excellent two days with the Kool-Aid. Firstly I used the opal undyed sock yarn and some undyed 4ply, then today I used the aran weight yarn. Am still waiting for the aran weight to finish drying but think I prefer the colours achieved with the 4ply. I also washed out the recycled sari silk yarn so as soon as the needles arrive can start work on that. 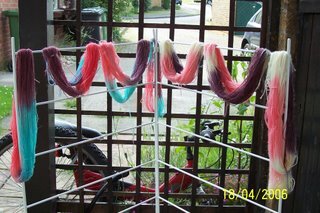 I used the dip-dying method for the 4ply yarn, just dipping it into the dye in a plastic cup then putting the yarn in the microwave – this seemed to work really well and some great colours were achieved. I was however only using 25-50g of yarn at a time, as I was wanting to experiment more with colour than aiming to achieve the perfect yarn to knit with, however I now have enough of the same colour combinations to knit a few pairs of trainer sock – perfect for presents in this weather. The aran yarn was dyed in batches of 100g and I had to adapt the method for this – I put the yarn in a microwave dish added the dye squished and cooked for 2 mins. This appears to have done the job but the colours are not so pleasing – but I will pass final judgment when they are dry and balled. As soon as this is done I will post piccies for all to see. All in all I am pleased with my attempt and will definitely be making it a regular in my crafting timetable. I am no longer a blog virgin… and it didn’t hurt one little bit. I have been thinking about doing this for a while but never got round to it, but what with uni over until October thought i’d give it a go. The commencement of the blog coincides with my first attempt at Kool-Aid dying tomorrow (well today really, but after some sleep) so my next entry will be either joyous and jubulent or gutted and gruesome. Hopefully with pics if a) can get camara working and b) can work out how to upload pics. I spend most of my time knitting or studying. A rather unvaried life for some, but I like it. I am hoping that this blog will allow me to share my knitting and dying triumphs, (and hopefully spinning, if i can find a teacher) and allow me to share my experiences of ME. Knitting and ME are two of the most dominant things in my life so on a day to day basis it is these that either keep me going or drive me down. On the upside i have a very supportive boyfriend and 6 gorgeous little hamsters who no doubt any regulars will come to know and love – the hamsters that is, not the boyfriend.